Encore is located within the beautiful golf community of Reunion Resort. Think of it as a private resort within a resort. As a guest of the Encore Resort at Reunion, you have access to enjoy many of Reunion Resort's amenities, including the restaurants, spa, golf driving range and seven of the resort's fabulous pools. Explore Reunion Resort and enjoy on of its many restaurants and pools. On the 11th floor of the Reunion Grande sits a 7,000-square foot year-round indoor/outdoor fine dining restaurant. Eat inside the beautifully appointed restaurant or enjoy a handcrafted cocktail and tapas on the rooftop terrace lounge sitting beside the pool while enjoying the music and an amazing view of the Walt Disney World fireworks. Described as a modern steakhouse with nouvelle feel, Eleven is a great place to enjoy wonderful steak, seafood and other signature entrees in a restaurant that embraces the farm to table philosophy of cooking. Chic and progressive in ambiance and décor, the open air veranda and nightly fireworks accent the sights and sounds of the open kitchen. The impressive wine list and signature cocktail menu along with expanded by-the-glass selections offers wine pairing and libations for every palate. Eleven is open from 5:30pm - 10:00pm for dining and the bar is open 5:30pm - 12:00am. ​An authentic Italian Bistro, Forte features fresh ingredients that are indigenous to the region of Tuscany, but also reflective of all regions of Italy. The menu uses seasonal ingredients and classic preparations. Warm and family friendly, the room while formal is warm and inviting accented with Italian music and friendly family style service. The wine list features extensive cabernets and merlots and a signature Italian regional section that pairs perfectly with Forte’s pastas and entrees. Forte is located on the main floor of the Reunion Grande. Forte is open Sunday - Thursday, 5:30pm - 9pm and Friday - Saturday, 5:30pm - 10pm. ​Located within the elegantly appointed Reunion Grand Hotel Lobby you will find a relaxing lounge to start your night off with a light snack or a pre-dinner cocktail. The Reunion Grande Lobby Bar offers sumptuous appetizers and freshly prepared sushi on select nights for your dining pleasure. Enjoy music from the grand piano or play some chess or checkers while enjoying a drink with friends. The Sushi Bar is open Sunday - Thursday, 4:00pm - 11:00pm and Friday - Saturday, 4:00pm - 12:00am. ​The Reunion Clubhouse, located next to the Reunion Grand, features indoor and outdoor dining served in a casual and comfortable setting. The menu has a broad appeal to golfers and resort guests alike with items that are simple and recognizable. Expect American comfort food served in a warm and friendly atmosphere. You can also settle into the bar for a meal and a beverage. 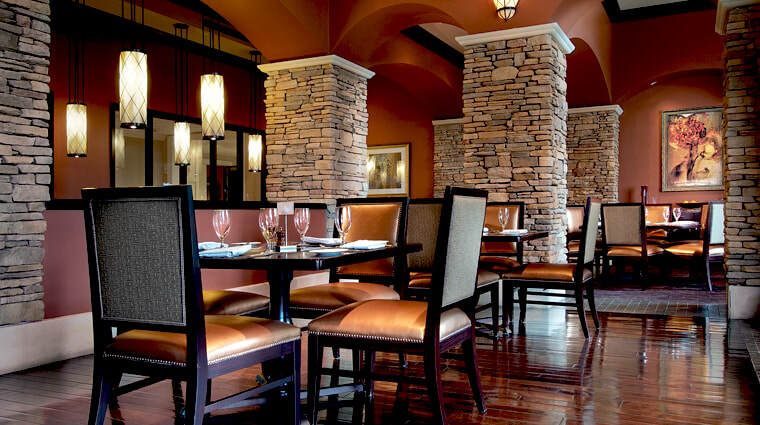 ​Traditions at The Nicklaus Clubhouse features American regional cuisine served in an upscale sports bar setting. The menu is seasonal and local with farm to table elements and a public house feel including craft cocktails and signature barrel aged bourbon program. The open-air kitchen and service style is designed to be friendly and welcoming and appeal to members and locals alike. Weekend entertainment and signature drink menu make it a gathering place for celebrations large or small. ​The delicious menu and refreshing smoothies will soothe even the most particular poolside appetite. Overlooking the Seven Eagles Pool Pavilion and the Palmer course, the Cove offers a menu of sandwiches, salads, snacks, and smoothies with the flair of the islands, as well as a full bar with daily happy hour specials. ​The Cove is open Sunday - Thursday, 11:00am - 6:00pm and Friday - Saturday, 11:00am - 7:00pm.